President of Earth is the title held by the leader of the Earth government. The President is usually selected through elections held throughout Earth. At some point the Earth united under a planetary government. This government and its flag seem to be modelled after those of the USA, which may imply the country seized control of the planet. The President of Earth is the planet's head of state, with elections being held at regular intervals or following a president's death, as in the case of the late President McNeal. Presidents may be any species, model of robot or cyborg as long as they receive enough votes, but they must be of Earthican citizenship (born on Earth). 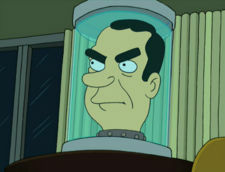 As of late 3000, the current president is Richard Nixon's head. Earth has had numerous presidents, both humans, robots and aliens. After President McNeal was killed by Omicronians in an attack in year 3000, an election was held, which Richard Nixon's head won. Nixon held the title until the Third Omicronian Invasion of Earth in 3010, in which he forfeited and Omicronian leader Lrrr gained office. The Omicronians leave after the invasion and Nixon is not seen again as president, however according to a comment by David X. Cohen in an interview, it's probably safe to assume Nixon regained office. Nixon appears again in office in The Futurama Holiday Spectacular (6ACV13) (non-canon), and in Cold Warriors (6ACV24) discussing strategy with Zapp Brannigan and the Surgeon General, Dr. Ogden Wernstrom. Nixon was challenged in another election in 3012, with his biggest opponent being Senator Chris Travers (7ACV03). While Travers' campaign intially faltered, Leela helped him reinvigorate it and he eventually won the election. Nixon's loss, however, caused Travers to fade away. In the timeline where Nixon won, cheap alien labor was eliminated and Earth's economy collapsed. Working class humans were eliminated by Nixon to make Soylent Majority, and robots were left with all jobs. When a robot uprising occured, the last remnants of humanity hid underground. Travers was sent back in time to run against Nixon. With Nixon's loss, the robot uprising never occurred and Travers was never sent back in time. All traces of Travers from the election eventually disappeared and Nixon won the election. Former US presidents, without a suitable new body, are ineligible to be president. President Fxjkhr - 60th President. President McNeal (???? - 3000) - killed by Omicronians while in office. President McNeal was president until his death in the year 3000 (1ACV12). Nixon, the current president of Earth. The Omicronian Lrrr was briefly president in 3011 (6ACV11). Harold Zoid played the President of Earth in the 3001 film The Magnificent Three. This page was last edited on 16 October 2017, at 08:18.